The group accuses legislators of not using the fund for the intended purpose for which reason; it must be scrapped and channeled into other beneficial developmental projects. 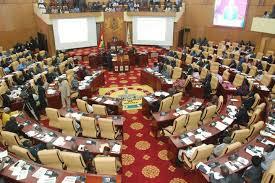 All 275 legislators in Ghana’s Parliament receive about GH¢ 35,000 annually being their share of the National Health Insurance Fund which is supposed to be used to improve healthcare delivery at their various constituencies. But the NGO believes the wanton abuse of the fund by the MPs for personal gain has defeated its purpose and therefore the amount should be used to strengthen the collapsing national insurance instead. Executive Director of the NGO Clement Asokia in an exclusive interview with ghnewnow kumasi desk Editor Isaac Bediako maintained that state funds allocated to MPs must judiciously be used and accounted for. “Last year alone GH¢ 9,629,000.00 was disbursed to the MPs under this category. I think this money should be given to the Health Insurance Authority to settle its accruing debts in the various regions because the MPs don’t need it. It is a misplaced priority to give them the money”, he revealed. But MP for Asante Bekwai Joseph Osei-Owusu who thinks otherwise explains that the use of MPs’ share of the fund is for the implementation of a comprehensive project. According to him, the implementation of the said project must be done in collaboration with the District Health Director of the constituency of the MP with an approval from the Director of Health Services who is the spending officer. “No money comes to the MP directly. Questions of what you will use the money for are clearly stated. No government money is ever spent by MPs”, he explained.